Voyager. – Life Is Such A Sweet Insanity. I’ve been rewatching “Star Trek: Voyager”. I didn’t regularly watch the show back in the mid 90s, so this is my first time watching the series from episode one to its end. I just finished up season one today. I’m looking forward to season two. Even though I’m not intimately familiar with the series, I do admit, without hesitation, that Captain Kathryn Janeway is my favorite of the Star Trek captains. I’ve always admired her grit, her dedication to science, and her determination. I know many Star Trek fanboys never liked the idea of a female captain, but I’ve never had a problem with it. Even back when “Star Trek IV: The Voyage Home” came out, I enjoyed the brief scene of Captain Sinclair of the U.S.S. Saratoga. No nonsense, that’s what Starfleet needs. One starship captain I did not enjoy, though she was seen for a very short time on bootleg videos, was the original captain of the U.S.S. 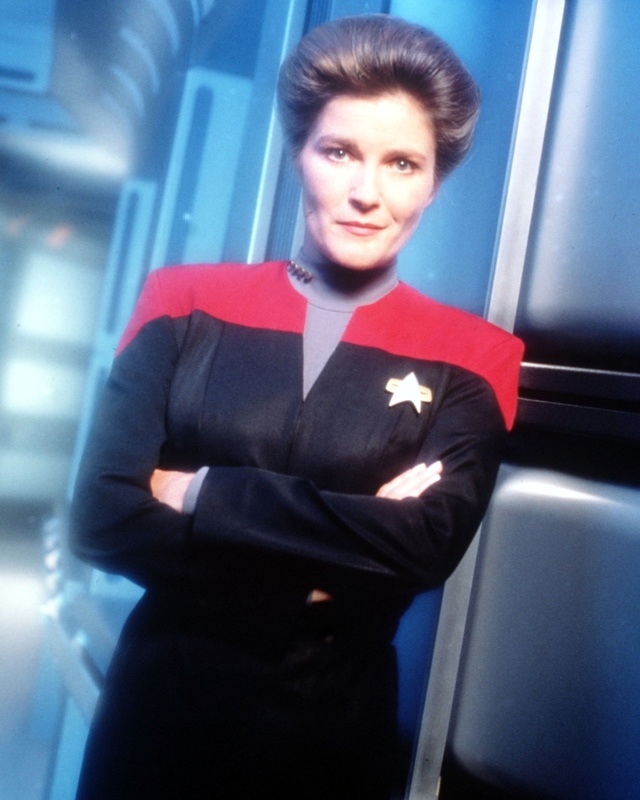 Voyager, Captain Nicole Janeway. Played by Geneviève Bujold for only the first two days of filming of the pilot of Star Trek: Voyager, it was agreed that Federation space was not for Bujold and she left the series. A few short scenes on YouTube are all the exist of the experience. Kate Mulgrew is a natural for the role. I’m not a fan of the current Star Trek series, “Star Trek: Discovery”. They lost me at the end of episode two when Captain Georgiou met her demise. From there the show turned into a Mary Sue* affair taking place in a universe with way too much strife. One of the things that I’ve always loved about Star Trek is that it showed a time when human society evolved into something more compassionate, driven by learning, exploration, and seeking to better oneself. The Star Trek universe has always been my escape from whatever we have today, especially in this Age of Chaos, and watching a bunch of strife and chaos in the Star Trek universe in the rebooted movie series and “Discovery” has held little of my interest. But Captain Janeway and U.S.S. Voyager? I love it. I’m happy the series is available on Netflix and I’m looking forward to watching every episode in original broadcast order. I might even venture out to a Star Trek convention this year and see if I can shake Kate Mulgrew’s hand. I love nuances she brought to Captain Janeway.